Custom gun makers keep tweaking John Moses Browning's venerable design and, while you might think that after 97 years of tinkering the 1911 has been perfected, believe me--you ain't seen nothing yet. I recently had the opportunity to test the STI Sentinel Premier, which is advertised as being equally suitable for use as a service pistol or for competing in the various action pistol shooting disciplines. After shooting it extensively, I can tell you that not only is the Sentinel a serious combat pistol but it has already been approved by the International Practical Shooting Association, U.S. Practical Shooting Association and the International Defensive Pistol Association for use in their various divisions. My test pistol came with the optional (and oh so attractive) hard chrome finish and ambidextrous thumb safeties, and as soon as I picked it up, the quality of materials, manufacture and assembly were evident. The Sentinel comes standard with all the bells and whistles demanded by today's armed professionals and serious competitive shooters. The slide boasts front and rear grasping grooves that not only look good but allow charging and clearing the pistol with perspiring hands or when wearing gloves. The top of the slide has been flattened and grooved to cut down on glare and cut to accept a ramped tritium front sight, which is mated to a Dawson/STI Perfect Impact--a fully adjustable tritium unit--at the rear of the slide. Both of the sights are mounted low so as to not interfere with drawing. The Sentinel's ramped, fully supported barrel is held in place by the traditional 1911 muzzle bushing, a match-grade unit that ensures consistent tight lock up and functioning. The muzzle end of the tube has been crowned to fit flush with the bushing, which is not only attractive but helps protect the vitally important rifling at the muzzle from damage. The sides of the slide have been polished bright, providing an attractive contrast to the dull finished frame. At the rear of the forged steel frame is an STI Commander-style hammer that permits easy thumb cocking, while the extended thumb safety levers allow smooth and positive manipulation. Metal has been removed from under the trigger guard for a high grip which, when combined with the high, beavertail grip safety, provides above average ergonomics for fast, accurate follow-up shots. Recoil control is further enhanced with 30 lpi checkering on the front strap and mainspring housing, as well as the checkered Cristobal grips. At the bottom of the grip frame is a moderately sized magazine well funnel. 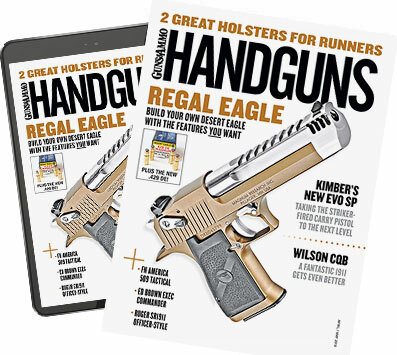 While originally designed with competition shooting in mind, I believe that anything that can make reloading smoother, faster and more positive has a definite place on a combat handgun. The Sentinel's internals will be familiar to anyone versed in the mysteries of the 1911 and disassembly is greatly facilitated by the use of the STI Recoil Master spring system. This uses a plastic sleeve that facilitates removing and installing the compressed spring unit. Yes, that's right--no more broken fingernails, busted thumbs or muzzle bushings flying up past your nose to get lost in your workshop. The Sentinel is chambered only in .45 ACP, a fact sure to please all true 1911 fans. The combination of the Dawson/STI Perfect Impact rear and the ramped front proved visible in all light conditions and made for fast acquisition and target transitions. Shooting buddy Butch Simpson and I headed out to the range to see if the Sentinel performed as well as it looked. Accuracy testing was conducted from an MTM Predator rest at the regulation 25 yards with four different brands of factory ammo and two of my regular competition handloads. Butch and I each fired two groups with the six types of ammo producing two dozen extremely consistent groups, none of which was larger than 2.8 inches in size. Honors for the smallest group, a mere 1.6 inches, went to Atlanta Arms & Ammo's 185-grain match load, but this pistol proved a tack driver with whatever we stuffed in the magazines. the pistol high on my belt and close to the body for smooth acquisition and presentation. The muzzle is crowned to fit flush with the match-grade bushing. Five yards. Draw pistol and fire four rounds on each target, head shots only. Perform a combat reload and fire four rounds on the body, firing the pistol one handed. Ten yards. Draw pistol and double-tap each target, perform a combat reload and repeat four times. Fifteen yards. Draw pistol and fire eight rounds on target No. 1. Perform a combat reload and repeat on target No. 2. Reload, reholster and repeat. Not only did the Sentinel perform flawlessly--not a single failure to feed, fire or eject--but during these drills the practicality of the sighting arrangement really came to the fore. The white "donut" encircling the tritium insert in the front sight was visible even in bright light while the two inserts in the rear sight were subdued. This allowed fast acquisition, alignment and transitioning between targets in daylight, something that I find difficult with the traditional three-dot night sights. Shooting the pistol a few days later at twilight showed the tritium sights to be bright and clear. As I feel it is an excellent way of judging how well a pistol really performs under pressure, the next few weekends found the Sentinel ensconced in my holster as I competed in Single Stack Division at local USPSA matches. While I would like to report that I won my division in all these matches (or even one of them) I cannot. But I did finish near the top each time. My only two complaints are purely personal preferences. First, I found the magazine release button a bit too short for fast manipulation. Second, I would like to see an arched mainspring housing offered as an option. While the flat style is all the rage today, I tend to hit low when I shoot fast with pistols thus equipped, and for that reason I have installed arched housings on all of my 1911s. Aside from those minor issues, I found the STI Sentinel Premier a fitting example of the modern gunsmith's art and believe that, regardless of the tasks you might set it to, it is ready to run--right out of the box. A plastic sleeve makes removal of the compressed Recoil Master spring system quick, easy and painless.